I agree that we need more quietude in our lives. I am living in a noisy apartment complex and cant wait to move to peace and Quiet. Wonderful blog, Chicky. Will definitely follow you! Such a relevant point. We are so lost in the noise around us that we fail to hear what's important. Nice post. Living in a big city now, I miss the country quiet of my childhood. BTW, bought your A to Z of Blogging -- really enjoying it! It is so much harder to find quiet in today's world. I think it is one reason I enjoy hiking so much. It is quiet, peaceful and a great time to reflect on things. I need my hours of quietude in the day. But there are times I look forward to seeing the civilisation. The magic of stillness is surely not to be overlooked. Yes! We all need those moments to be with ourselves and get energized for the world! If we're always occupied by someone or the other all the time, no wonder we're going to lose our minds! 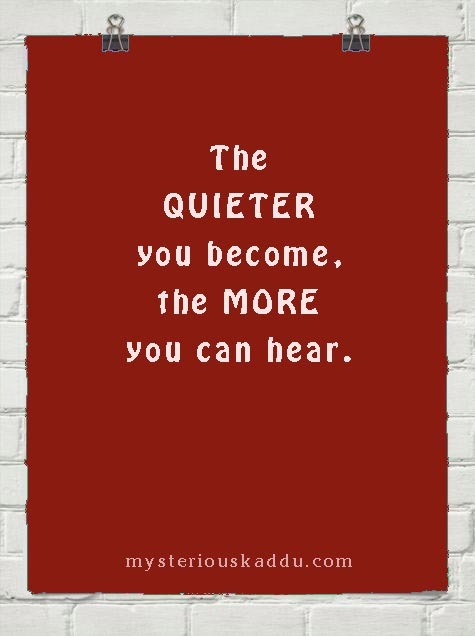 Quietude is a precious commodity these days. Somedays I ask the kids to sit quietly for five minutes, just five, and you should see them squirming with their eyes on the clock. Great points about the benefits of Quietude. I totally agree. As an Introvert, I need my downtime and that includes Quietude away from noise and distraction. That said, I am still on the Internet too much but I try to get out for a walk every day with the dog. That helps clear my head and is good for me. Sitting all day isn't good for me. Good post. I am enjoying your posts and tidbits of wisdom. Keep em coming! "The quieter you become, the more you can hear." Great quote. It also connotes being a good listen. I've gotten into meditation a bit, and I find it's more useful if I don't have any "relaxation" music playing, but just listen to the sounds of silence. Three months ago, we moved from the beach to the mountains. From a small fishing village to a city. We are moving back in three months. We miss ocean sounds and birds in the morning. City sounds are not for me. Oh! It must be all the more difficult for you, Molly, 'coz you've had a taste of the quiet country life! I hope you find it useful. Please feel free to write to me in case of any questions. Oh yes, Hilary! That happens with me too. I just tend to "space out" at times! @Weekends in Maine: Oh yes, hiking can be a very peaceful experience. I've never had any hiking trails or groups close by, but I do enjoy going for walks. Sometimes, I wish I could do that too... take off to a jungle or some Himalayan monastery, you know! Sighhhh! Thank you for stopping by, Irfanuddin! Oh I definitely tend to lose my mind, Geets! I NEED my alone time like a drug! I finally caught up with the replies to comments here. So that's one thing off from my pending-tasks list! Having a dog is just so good in so many ways! I wish to own a German Shepherd some day. Oh yes, Gail. Meditation is so much more effective without any background music! Do read up about them, Sara. It's quite interesting actually! And I'm planning to go off Facebook after a month! Phewwww! It is very true Kadambari, the more you speak the more you miss. Very nice word choice.